Furnspace is an exclusive online destination for furniture and home decor accessories. Furnspace strives to bring its customer the best quality, hand-picked products from across the globe and translate this quality through the images on their website. Their robust eCommerce platform provides a wide selection of furniture and accessories categorized by room type. The wide product selection and high-quality images on their site posed a problem for Furnspace, especially on mobile. How can an image-intensive eCommerce platform speed up its user experience (UX) for mobile customers? The solution that Furnspace evaluated and chose was ImageEngine by ScientiaMobile. 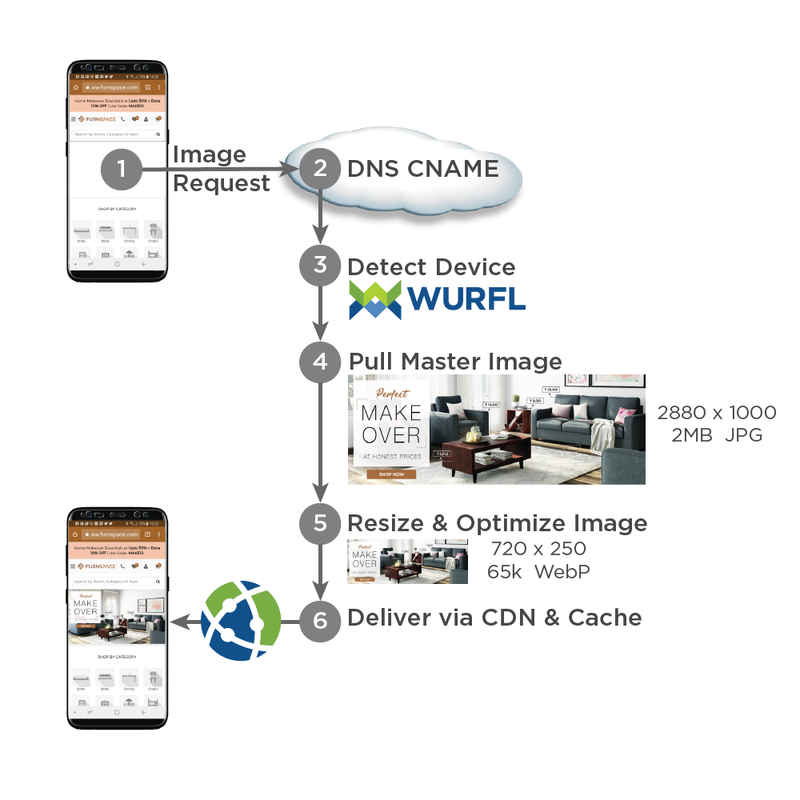 Furnspace extensively tested ImageEngine to ensure that it tailored images to each mobile device and delivered them quickly through its content delivery network (CDN). A major opportunity for improving website speed was to reduce Furnspace’s image payload without sacrificing image quality. A mobile shopper buying Furnspace’s products typically downloaded a 4MB page, the majority of which were images. On mobile devices, these images were heavier than they needed to be. Higher resolution and file size did not yield perceptible differences in UX. If Furnspace could reduce their image payload, then mobile pages would load faster. Initially, Furnspace had a high bounce rate and a predominantly desktop purchasing audience. As an Indian eCommerce company, Furnspace knew that many Indian customers use their mobile phone for making purchases. Mobile UX was therefore crucial to attract and convert mobile visitors. Furnspace knew they needed to accelerate their site’s loading speed. Furnspace had already implemented a traditional CDN with Amazon Cloudfront, but it only slightly improved performance. Furnspace needed a solution to accelerate their website, improve conversions, and control future CDN operating costs. Next, ImageEngine leverages this device information to automatically resize, convert, and compress images in real time. It resizes only when images are requested. ImageEngine also caches images, so there is no need to resize them for subsequent requests from identical devices. Finally, ImageEngine uses its global CDN with device-aware edge servers. This means that ImageEngine’s logic is pushed to the edge of its global network with more than 40 PoPs. Images are cached as close to customers as possible, resulting in a 65% faster webpage download time. Furnspace started their rollout of ImageEngine by performing A/B tests on specific mobile devices. They tested on many smartphones, from Samsung Galaxy to OnePlus. Across all the devices they tested, ImageEngine produced a very fast UX. For deployment, Furnspace used CNAME DNS records to direct traffic through ImageEngine. Immediately, it began to yield speed improvements compared to Furnspace’s legacy CDN approach. ImageEngine’s simplicity and ScientiaMobile’s 24/7 support made this rollout quick and painless. Faster Page Loading, Higher Conversions: Accelerate your website and decrease payload by more than 60%. CDN Savings: Pay only for optimized, resized image bandwidth. Automatic Image Resizing : Automatically resize and cache your master images. Simple Deployment: Easy integration with leading e-commerce platforms. In terms of speed, ImageEngine helped Furnspace accelerate web pages from 17 seconds down to 6 seconds. Additionally, ImageEngine generated numerous business improvements that far outweighed ImageEngine’s cost. Faster load times helped improve Furnspace’s rankings on search engines. This search engine optimization improvement on Furnspace’s 40 most important keyword searches yielded a 230% increase in queries. Purchases doubled after deploying ImageEngine. More visitors were staying on their site and converting to paid customers. Much of this improvement came from mobile customers. The percent of revenue coming from mobile purchases increased from 38% to 45%. Operationally, Furnspace reduced the costs of their image management process and CDN. They had previously custom-developed a system to render different image sizes based on device type. But the result was nowhere close to what ImageEngine provided, so they removed the custom code after onboarding ImageEngine. In terms of CDN expenses, ImageEngine generates a smaller payload compared to Amazon Cloudfront. Originally, usage was 3TB monthly on Furnspace’s site, but afterwards, Furnspace now had only 420GBs, which is a huge 86% reduction in usage. 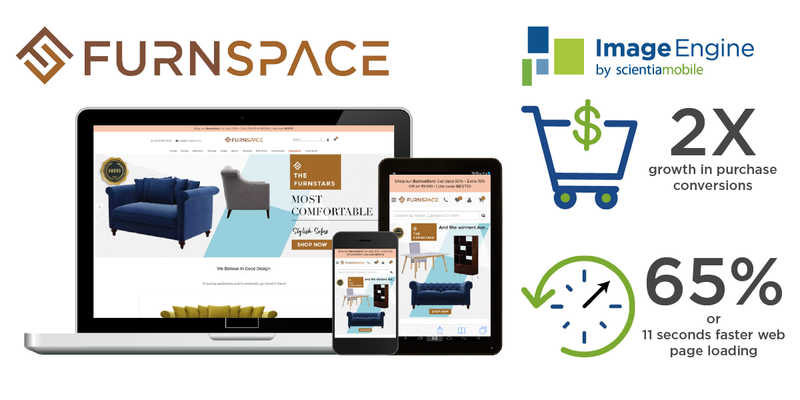 As traffic scales on their site, Furnspace expects the ongoing CDN savings to widen.